« THIS SATURDAY I’M GRATEFUL…. oh your goop looks fantastic and so happy you all had fun with the rocket balloon…so quick and easy. Happy Monday to you Emma. omg.. that looks like such fun.. completely forgot about goop.. will have to try this out on the kids! !<br /><br />thanks for joining in with kiddy art! <br /><br />for your info, i&#39;ve changed the day of the week so the segment starts on a sunday and is open through the week till end of saturday. 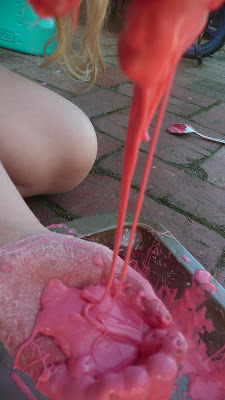 Oh my gosh, I love this stuff…We did it awhile back and my little toddler was quite hesitant at first and then he dived into it…<br /><br />Great colour gloop too! OH it does look like fun. Will keep it in mind when my granndies visit next. definitely trying the goop it looks like fun! The ballon rocket thing-imy i&#39;ve seen at my son&#39;s kinder (and playschool) and really it doesn&#39;t get any better than balloons taking off! hope your feeling better ! What great activities at your place!<br />Love the goop one, will have to colour it next time like you have – looks brilliant! I&#39;m sure they loved it. Yes, a sucker for punishment. Hope the cleaning up wasn&#39;t too bad. Thanks for joining in again. Lou.